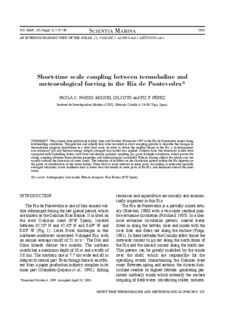 Two cruises were performed in May-June and October-November 1997 in the Ría de Pontevedra under strong downwelling conditions. Temperature and salinity data were recorded in short sampling periods to describe the changes in thermohaline property distribution in a short time scale. In order to obtain the residual fluxes in the Ría, a bi-dimensional non-stationary salt and thermal-energy weight averaged box-model was applied. Outputs from this kinematic model were compared with Upwelling Index, river flow and density gradient, resulting in a good multiple correlation, which proves the strong coupling between thermohaline properties and meteorological variability. Ekman forcing affects the whole area but mainly controls the dynamics of outer zones. The intensity of its effect on the circulation pattern within the Ría depends on the grade of stratification of the water bodies. River flow is more relevant in inner parts. According to estimated spatially averaged velocities, water residence time is lower than two weeks in outer parts of the Ría, and decreases toward the inner zones.